Agricultural producers’ sentiment was unchanged in May from a month earlier. 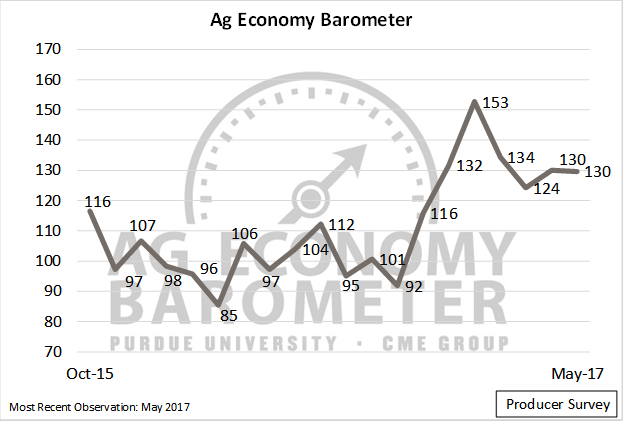 The latest reading of the Purdue/CME Group Ag Economy Barometer – which is based on a monthly survey of 400 agricultural producers from across the country – was 130 (Figure 1). The producer sentiment index has hovered near 130 for five of the last six months and remains considerably stronger than both last fall and a year ago. Figure 1. Purdue/CME Group Ag Economy Barometer. October 2015 to May 2017. While the broad measure of agricultural producer sentiment was unchanged in May compared to April, the Ag Economy Barometer’s two sub-indices diverged in May. Producers’ forward-looking expectations, as measured by the Index of Future Expectations, improved modestly to 136 (Figure 2). This was the second month in a row that this index increased. Conversely, the Index of Current Conditions fell to 117, a 10-point decline from its April reading. Similar to the broad Ag Economy Barometer, both sub-indices are substantially higher than a year ago, indicating producers are more optimistic about current conditions and in their expectations for the future. Figure 2. 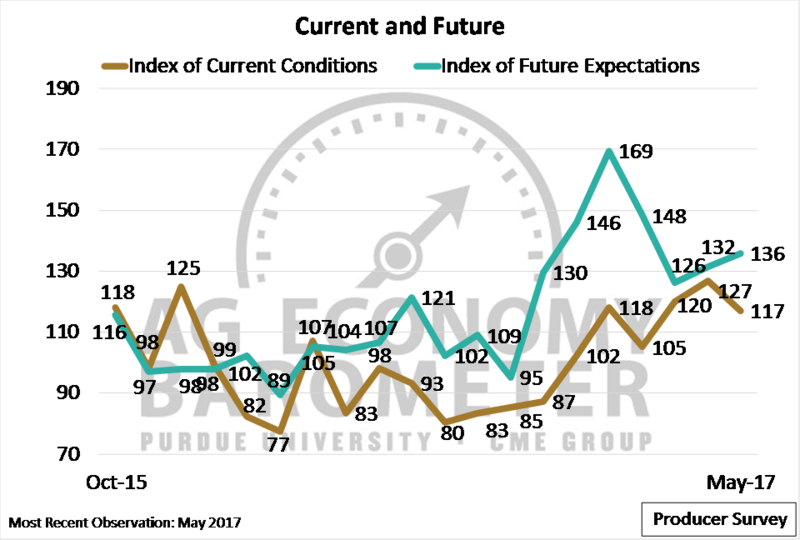 Index of Current Conditions and Index of Future Expectations. October 2015 to May 2017. Agricultural producers are surveyed quarterly regarding their expectations for farmland value changes. In May, 19 percent of respondents thought farmland values in their area would be higher in 12 months than currently, whereas 30 percent of producers surveyed said they expect farmland values to decline over the next year (Figure 3). This is the second quarter in a row that the percentage of producers expecting lower farmland values in the year ahead declined. Interestingly, reviewing results for the eight times this question has been posed (starting in November 2015), there was only one survey period (July 2016) when producers were more optimistic about farmland values in the year ahead than they were in May 2017. Figure 3. Share of producers expecting higher and lower farmland prices in their area in 12 months, November 2015 to May 2017. To gain more insight into producers’ long-term perspectives on farmland values, a new question was included on the May survey. It asked farmers about their expectations for farmland values five years ahead. Forty percent of respondents said they expect farmland prices in their area will be higher in five years than they are today (Figure 4). That figure is more than double the percentage of producers expecting higher prices one year out. Furthermore, just 16 percent of respondents expect farmland values in five years to be lower than today, which is about one-half of the share of producers expecting lower prices in 12 months. 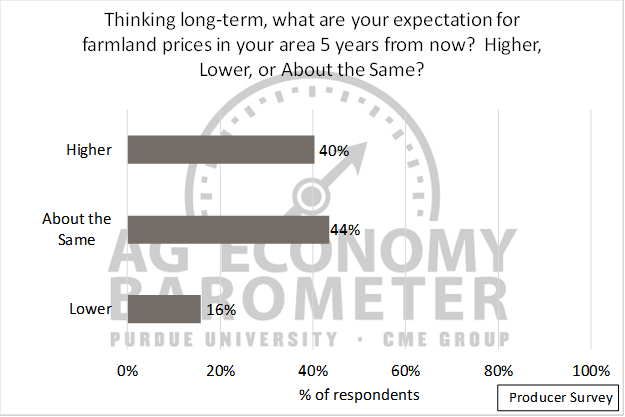 Looked at another way, more than 8 out of 10 producers surveyed (84 percent) expect farmland prices five years from now to be either the same as or higher than today. Figure 4. 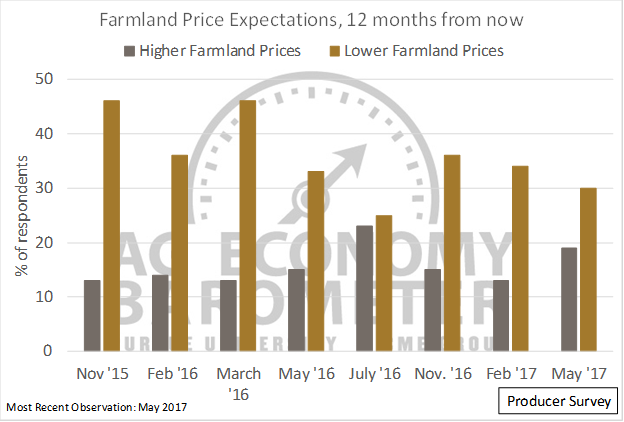 Producers’ expectations of farmland prices in their areas in five years, May 2017. Trade was a key source of debate during the 2016 elections and continues to be a priority for the current administration. In previous Ag Economy Barometer surveys, 93 percent of respondents rated agricultural exports as important to the agricultural economy and 80 percent of producers rated agricultural exports as important for their own farms. On the May 2017 survey, producers were asked specifically about their perspectives regarding the North American Free Trade Agreement (NAFTA). 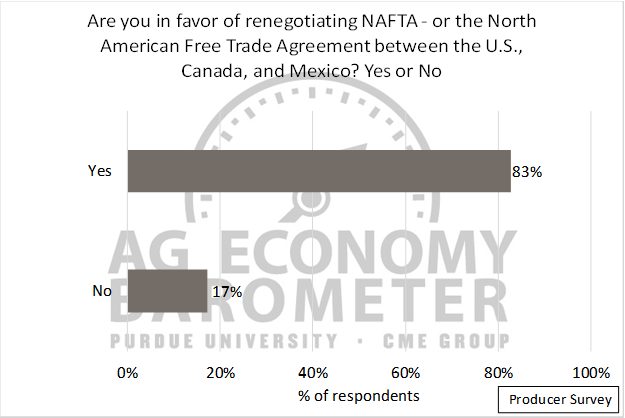 An overwhelming majority, 83 percent, of producers reported they were in favor of renegotiating NAFTA (Figure 5). Figure 5. Producer support for renegotiating the North American Free Trade Agreement (NAFTA), May 2017. When asked to share their perspectives regarding the likely outcome of a renegotiated NAFTA, 63 percent of respondents thought it was likely the outcome would be beneficial for the U.S. economy (providing a rating of six or higher on a nine-point scale where one was unfavorable and nine was favorable). However, the single most common response to this question from survey respondents (25 percent), was an expectation that the outcome from renegotiating NAFTA would be neither favorable or unfavorable, providing a rating of five on the nine-point scale. Thinking more specifically about the impact on agriculture, 61 percent of respondents thought the outcome of a renegotiated NAFTA agreement would be beneficial for U.S. farmers. Agricultural producers continue to be more optimistic about both expectations for the future and current economic conditions than they were a year ago. Producers’ perspectives regarding current conditions declined on the May survey compared to April 2017, but that decline was offset by an increase in optimism regarding future economic conditions in agriculture. Optimism about the future is also reflected in producers’ perspectives regarding future farmland values, as more than 80 percent of producers surveyed expect farmland values in their area to be unchanged or higher five years from now. Finally, survey results reveal strong support for renegotiating NAFTA among ag producers with an expectation that a renegotiated NAFTA will be favorable for not only for the overall U.S. economy, but also for the U.S. agricultural economy. *The Index of Current Conditions is derived from Q1 and Q5 from the outlined Survey Methodology. The Index of Future Expectations is derived from Q2, Q3, and Q4. Given the two sub-indices are based on a different number of questions, monthly changes in the sub-indices do not equal the monthly changes in the overall Ag Economy Barometer. More directly, it’s not possible to estimate the month-to-month change in the Ag Economy Barometer based on month-to-month changes in the two sub-indices.